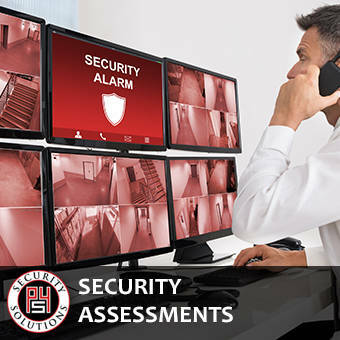 The highly experienced professionals at P4 Security Solutions are experts in conducting security risk assessments with regard to the physical layout of buildings, their access control systems and also the identification of situational risk scenarios. Access control strategy plays a critical role in adequately protecting not only main building entrances, but also the admit points of suites and offices. When it comes to providing a safe physical environment for employees and guests, it is very important to understand how to best protect them in light of the specific physical layout of their surroundings. The professionals at P4 Security Solutions can train key employees to recognize the signs of potential physical threats to people or property made from either internal employees or individuals outside the organization. By being keenly aware of what to look for with regard to indications of possible harm, your staff can be much more proactive in deterring such activity from occurring in the first place. One of the most important aspects of perimeter/facility security is being able to accurately monitor the movements of visitors once they are inside your building. The dedicated team at P4 Security Solutions can provide a comprehensive assessment of visitor communication protocols to ensure that your staff has a secure and effective way to keep track of office visitors’ whereabouts. Upon reviewing your current policies and practices, we can offer recommendations on how to optimize the ability to help visitors have productive visits, while at the same time allowing your organization to maintain critical safeguards. When it comes to partnering with a security assessment company, you can count on the decades of hands on, industry knowledge and experience that P4 Security Solutions can put to work in your organization.